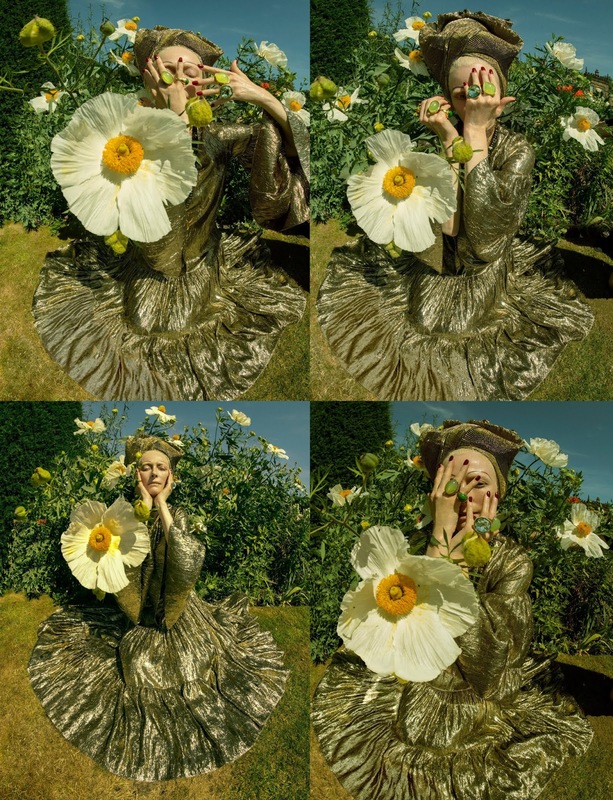 Photographer: Tim Walker. 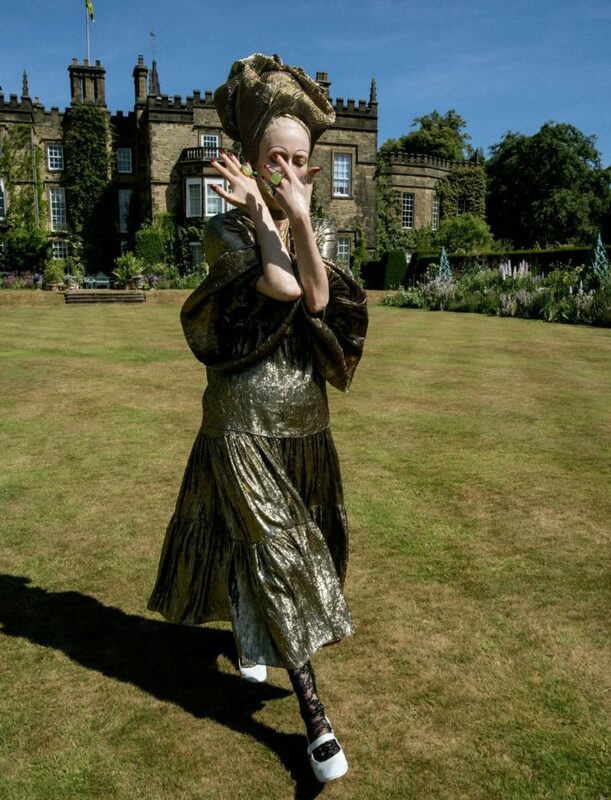 Model(s): Tilda Swinton. Source: W Magazine. Stylist: Sara Moonves. Makeup: Lynsey Alexander. Hair: Malcolm Edwards. 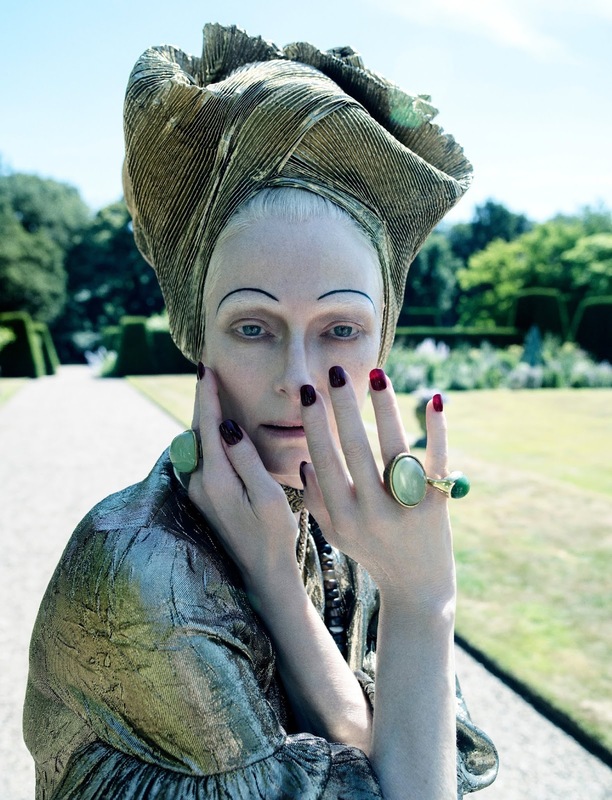 Tilda Swinton embodies the undeniable energy of Dame Edith Sitwell in ‘Poetic License‘ by Tim Walker for W Magazine, Vol. 7. This story was shot at Renishaw Hall, the childhood home of Edith Sitwell in Derbyshire, England. Tilda Swinton is the cousin of Dame Sitwell, of whom at the age of 3 served as a flower girl for her great grandmother’s wedding. A unique connection. Never was there more a renaissance relative. Watching her in an Interview I was struck with her deep eyes. Each time she would play some simple game of words with the interviewer – unbeknownst to him. Other time’s the glint in her eye would give way her internal game. And, that was the beauty of Dame Sitwell. Her acerbic wit always won out. Her humor was not simple but was effective. And those of the mindset who could follow such retort, were in the company of her dark, comedic charms. Like myself she was a lover or words. She longed for the blanket of coverage a block of letters could offered, and coveted the next phrase of poetic prose not as of yet conceived. Born into a backward kind of privilege. Her early life, to include her two brothers, was filled with tragedy and torment. However, from that convoluted cocoon was borne true beauty. Sara Moonves does something so exquisite here, making each piece a part of the stories pageantry. Flowing fabrics form a variety of simple, straight cut day-gowns, with the light silk covered in decorative brocade. 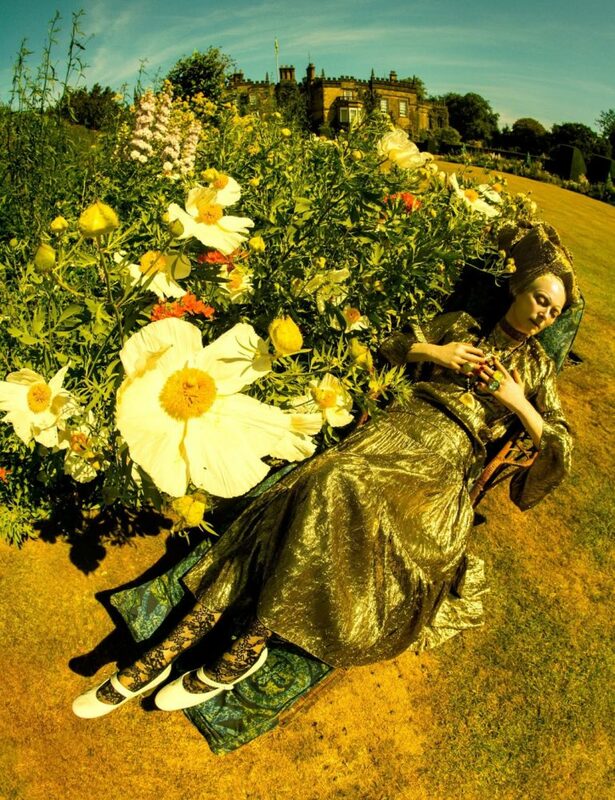 Nestled in the great garden, her gold charmeuse fabric glistened in the sun. Sitting inside the parlor her mint-green day-dress blends into the drapes. 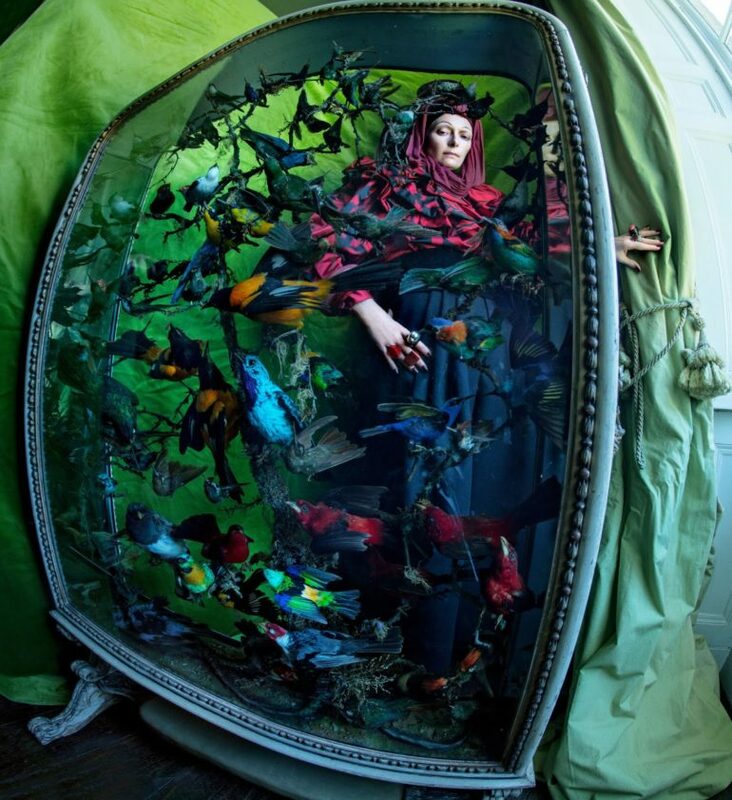 Wearing black, Tilda stands silently inside a large, ornate window-box full of brightly colored birds. 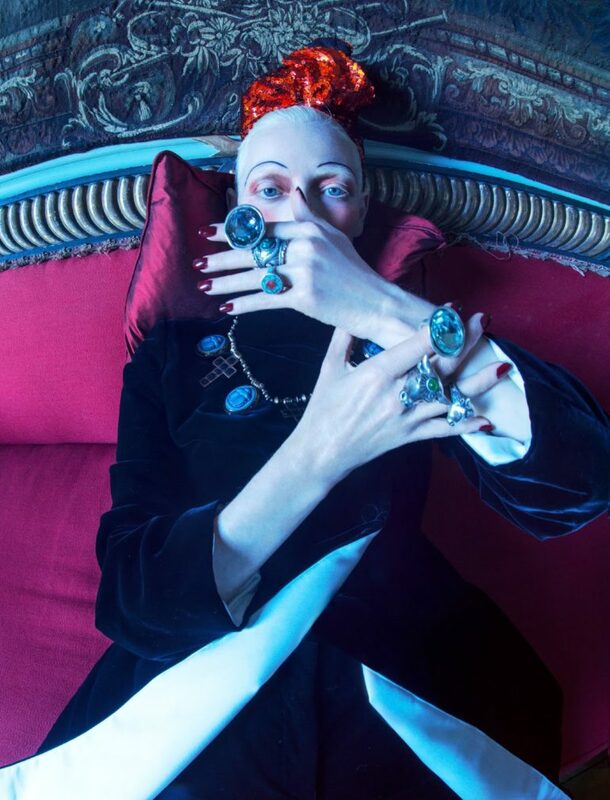 Yet these dramatic outfits are left naked without the exquisite embellishment of the Dame’s Famed Jewelry Collection. 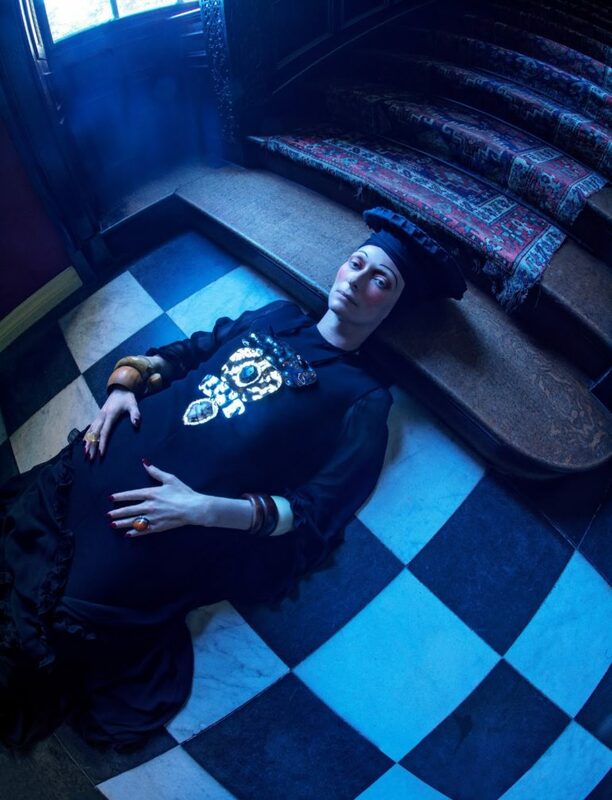 A beguiling blend came to fruition as, “Walker happened upon a trove of Sitwell’s famously ornate and oversize baubles while exploring the archives of London’s Victoria & Albert Museum.” Using inspiration from these fine pieces, we see the elegance of her existence come to life. For this fine creature, Jewels weren’t just add-on’s, they were sometimes huge pieces designed to divide the attention. Worn every day, they were as much apart of the wardrobe as the fabric proper. Lynsey Alexander pays tribute to this fearsome fighter through her artful application of drawn on brows. Black lines create a defining arc, just like the ones who graced her cousin’s face. Drawing without borders. A deep shadow encircles the lids, like a child with a crayon let loose. A grayish-beige crosses her lips as if to diminish their shape. Sitwell’s makeup was uniquely her own. Just like her wardrobe of choice, the parameters of which didn’t fit into any current appeal, but all suited her natural response to life. 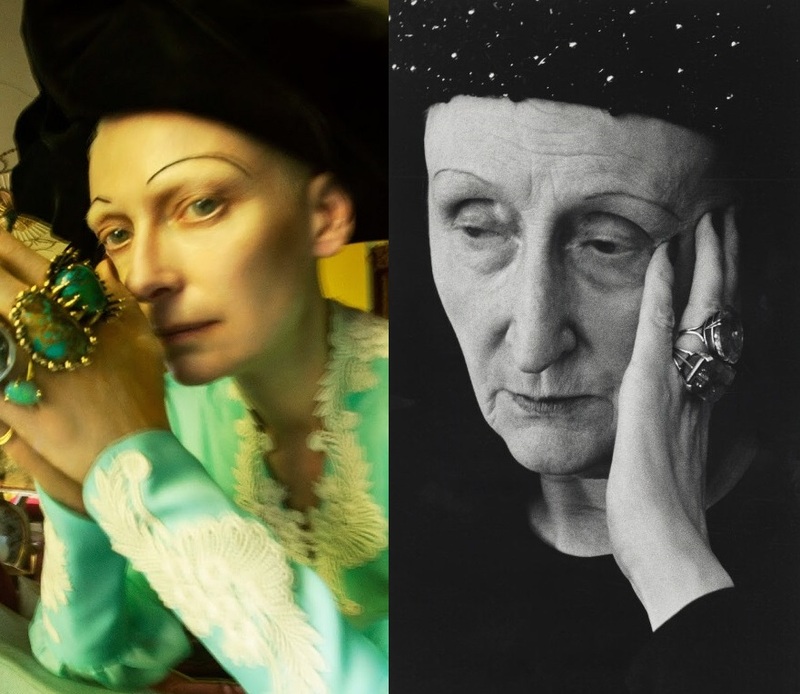 Lynsey uses the features of Swinton’s natural face to honor the honest connection of these women. To falsely copy the details of her physicality in a vain attempt to garner respect would be empty. The countenance can not be underplayed, as her profile is one of historic standing. Her nose was incomparable. The skin was akin to a palate the face a place to play. Rare, uncommon, individual ~ her features were those of mythic proportion. She wore it well as her profile became her most famous facet. Turbans wrap around in heady desire then reach for the stars to ever inspire. Malcolm Edwards presents a celebration of showstopping Millinery, as headgear from another era comes home to roost. 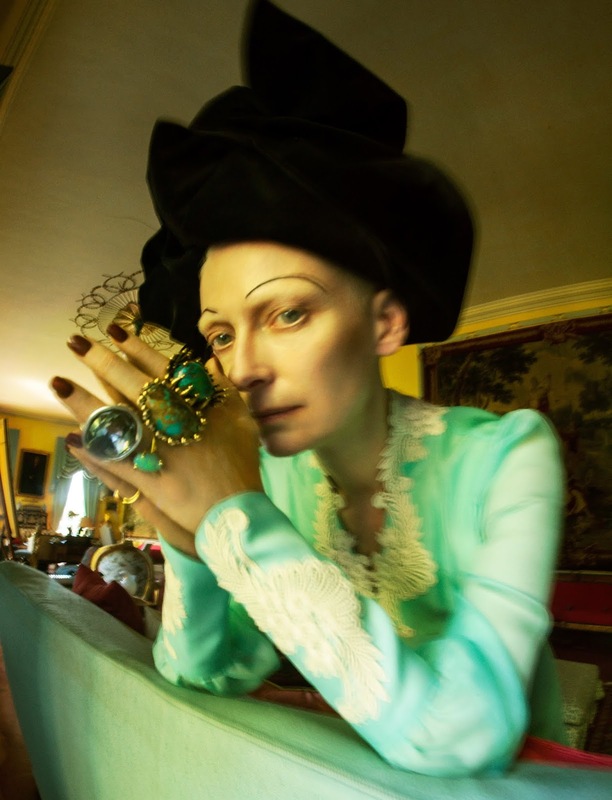 We see Swinton in a vast array of colorful chapeau’s, all taking on different shapes and sizes. Using a variety of material types, the wrappings are done with dynamic shaping technique. Echoing her cousin’s gregarious side, each crafted topper climbs over her head sticking like a ballerina mid-pose. 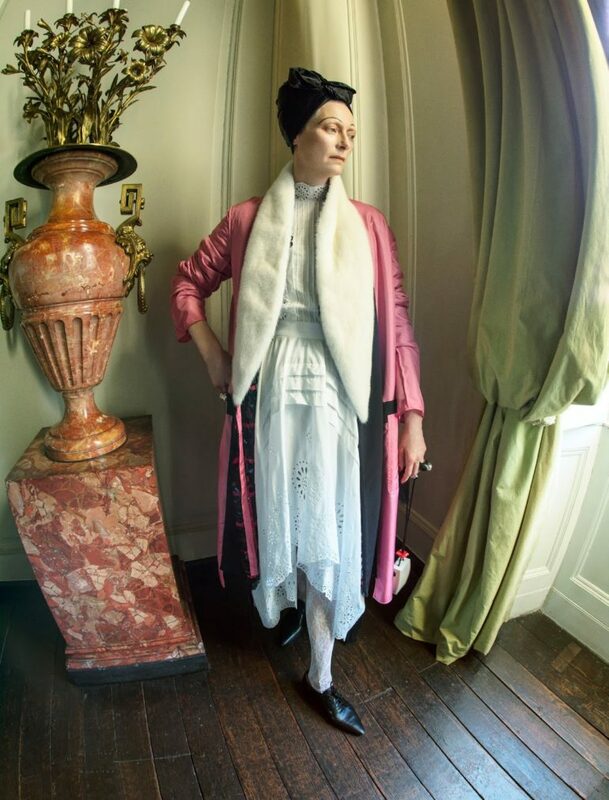 She was a walking work of art, and here, Tilda captures that momentum of hope in every phantom picture image. Every outfit is markedly different than today’s garbs. 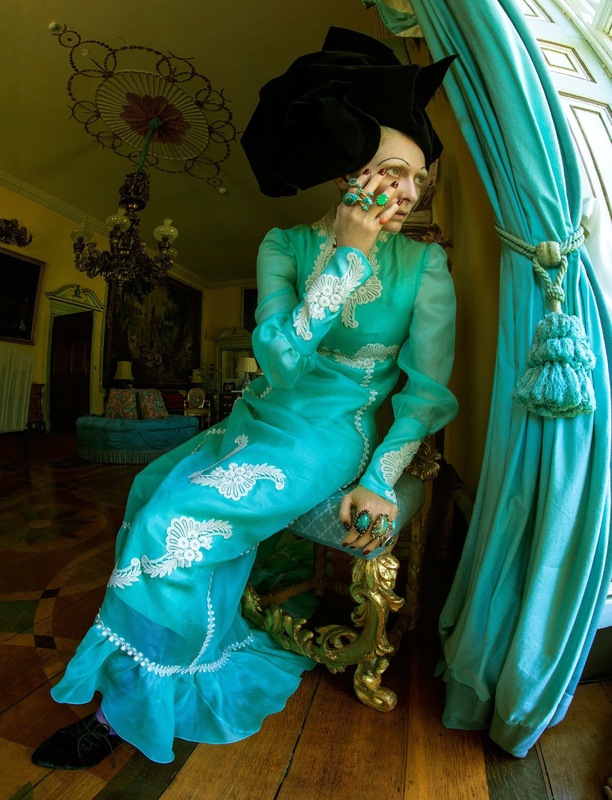 Instead of formfitting or excessive, they are a reflection of the woman’s eccentricities. 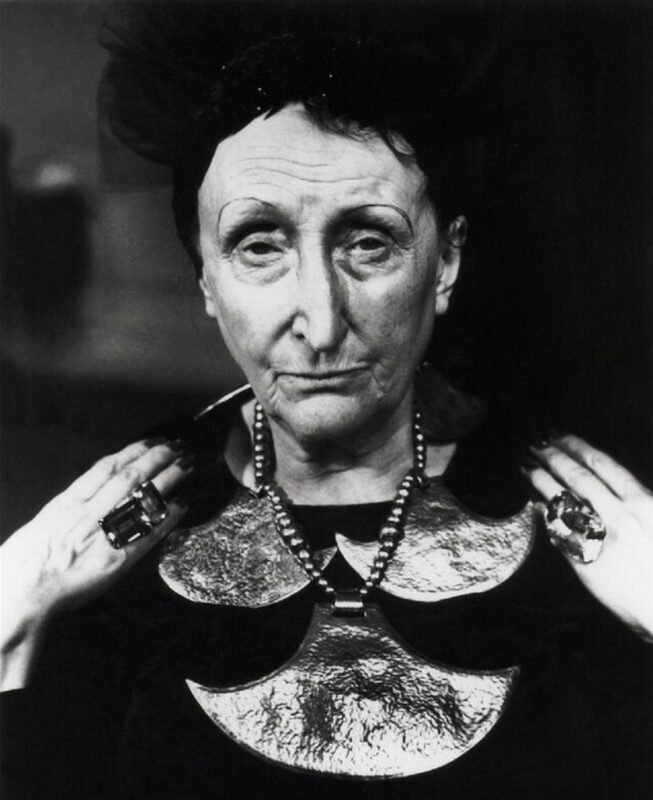 Her eclectic behavior drew vast critiques and eventually vast followers, of whom, called her creations of another time. Yet it was clear, her taste was driven from a place of raw instinct. Divined from the depths of who she was, each decision made was an amalgamation of her unending imagination. Part introvert part extrovert. Her character was an enigma her mind a gregarious machine. Using the Eyes of Edith as a Map to Home. “She believed that “Poetry is the deification of reality, and one of its purposes is to show that the dimensions of man are, as Sir Arthur Eddington said, ‘half way between those of an atom and a star. '” She literally danced to the beat of her own drum. Born with debilitating issues, her choices were built around these painful truths but her vibrancy would not succumb to them. When I think if her I will always remember the shape of her exquisite face. It is in those pictures of her grand profile that we garner so much hope. As a purveyor of words myself, I am in the same position as the late Sitwell. We honor every statement and consider every avenue to access. As I can imagine the lady saying herself… Anything less would be tragic. Here we have a picture of moving poetry. A person who truly lives her artistry. Walker gives us an exquisite ode’ to the original poet. The aching beauty of her countenance is reflected. Every wrinkle of her striking face tells a story. Every shadow waits to be healed by the light. In the waning hours of longing there comes a hope that can’t be named. We speak not of it’s life-force ~ or else silence turns to shame. Cousins Connect… Across the years we feel the link that exists between Tilda and Edith. To not appreciate that kindred relation, is to not be wed to the wonders of world. Their appearance is similar. There’s something in the artistic endeavors of each that emanates out of their beings. The more you stare the more you see… It is uncanny.